The axe is about to fall on another Australian automotive icon. Ford Australia has confirmed that its V8 ute will be chopped next year when the brand’s Ford Performance Vehicles (FPV) division is killed off. 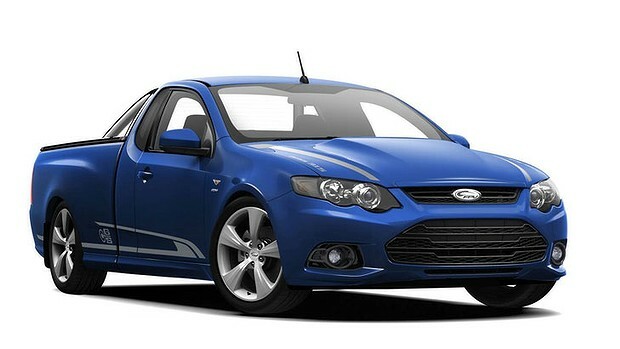 As Drive first revealed in July, the entire FPV range - including the iconic Falcon GT model - will be shelved in late 2014, when the final update to the Falcon model goes on sale. As a minor consolation for Ford fans, the company confirmed it would temporarily revive the XR8 sedan until Falcon production ends in 2016. But in a move that is likely to sadden die hard enthusiasts, Ford has this week confirmed the existing V8-powered FPV GS ute will not be superseded by an XR8 variant. Instead, the performance variants of ute will live on in only XR6 and XR6 Turbo form, bringing an end to a highly successful and culturally ingrained member of the blue oval’s local family. Ford spokesman Neil McDonald said the decision to axe the V8 ute came back to relatively low demand. “There won’t be an XR8 ute returning to the Australian market, the V8 ute will be gone with FPV,” he said. The Ford Mustang will return as the brand’s hero performance model once the Falcon range is wound back in 2016, in addition to the Ford Territory. Until then, Ford says a new Falcon XR8 variant will go on sale late in 2014, carrying over the FPV GT’s 5.0-litre supercharged V8 engine. Power outputs are unconfirmed but the current GT produces 335kW of power and 570Nm of torque. McDonald wouldn’t be drawn on whether Ford had considered any other performance-oriented utes for the future line-up after Ford’s planned 2016 manufacturing closure in Australia. While it doesn’t offer the matching character traits of a V8, the XR6 Turbo ute is no slouch. Its 4.0-litre turbocharged engine produces 270kW of power and 533Nm of torque – enough to propel it to 100km/h in about 5 seconds. Sales of Australian-made utes have languished in recent years amid a flood of cheap imported 4x4 models such as the Toyota Hilux. Ford’s Australian manufacturing compatriot, Holden, says it has experienced a slower uptake of its new VF Commodore ute compared with sedan sales. Australia's testicles have just shrunk even more. No V8 ute. What next? At least there's still gonna be an XR6 Turbo. It looks as if Ford can't be stuffed now competing with Holden anymore for performance grunt anymore. No more FPV. Holden would be loving the bragging rights now. they are going to have a ute body, and a v8 engine and computer for a sedan. how hard would it be to make it possible to buy an xr8 ute on order only? If enough people who b**ch and whinge and piss and moan on forums about them not making them actaually bought them they would never have stopped making them . Purely a commercial decision . Never understood why anyone would want to buy a high performance version of a commercial vehicle anyway . We are the only country in the world that ever made these type of vehicles . im pretty sure the us of a has made utility vehicles with a hyped up motor. if i recall some of them are now collectors items and get restored. The V8 ute is an Aussie icon. To not understand how someone would not want a high performance variation is beyond me. With Holden going now - the whole game is done! No gloating their side. Something just doesn't add up with all this. Surely they wouldn't want to out-power the outgoing GT with a 'lowly' XR8. In which case what's really the point in having the blower on it? I can't wait to see what the truth actually is. Regarding the ute...I wonder what the price difference between I6T and V8 is from ford spares, maybe you could offer up a swap upon purchase. I believe the way forward is to buy an entry level FG ute and install your own aftermarket engine. You will save so much $$$ and have a car that is truely your own. I own a Ford Ute with an aftermarket engine and I absolutely love it.